All day Garlands Shoot, Sunday January 8th 2017. Our First Shoot of the 2017 season. Well, we are into a New Year and all the committee and administrators of the club hope everyone had a good Christmas and New Year celebratory period, however it appeared we were all suffering from the lack of recoil therapy? This is perhaps why twenty-nine members arrived to remedy this situation. As is the norm on these occasions at Garlands, once the formalities were completed and free food vouchers distributed, the catering facilities at Garlands were as busy as ever fortifying everyone with bacon or sausage butties, tea or coffees, chocy bars etc in preparation for the day’s activities, or as the writer prefers bacon and egg butties. As usual with such a great group of chaps, everyone pitched in to help novices and probationaries, which meant everything ran as smoothly as ever on this very busy shoot. Congratulations to the new member and prospective new member from West Yorkshire, the distance you travelled to attend the shoot is very much appreciated. Thanks once more to the Garlands team for the excellent catering and shooting facilities and thanks to all who attended, particularly for the help that is always on hand whenever needed. Joint and Inter Club Indoor Shoot Saturday January 21st 2017. Urrgh. How unappealing thinking of target rifle shooting laid on freezing cold wet muddy winter ground in drizzly soaking stuff currently offered by the weather. Great, no problem at all, with our inter relations with other clubs coming to the fore once more this week end on the 21st a comfortable indoor range was in full use along with luxuries, pies, cakes, biscuits, teas and coffees etc, marvellous. Commencing about 4-00 pm a total sixteen members of our club alone took advantage of the facilities with RCO’s of both clubs helping each other out on the ranges accommodating the variety of details. Whilst the ranges were busy our Vice Chairman ran another of his excellent courses, this time covering the intricacies of iron sights and their technicalities, good stuff. The detailed shoot programmes were many and varied and kept everyone busy until late. The vital importance of safety and safe handling was most prominent as ever. Where to start with thanks? Well everybody really. For the officials and RCO’s, for the tuck contributed, for the hot drinks facilities, the training officer, secretary, treasurer, could go on and on but essentially thanks to everyone for the usual amazing efficiency and help always evident with you guys from the clubs involved. Some had travelled considerable distances so special thanks to you all and the great contingent again from Yorkshire. Staffs Phoenix all day Garlands shoot Sunday February 12th 2017. Sunday morning 09:00 at Garlands Shooting Ground. Oh it was cold, so cold, in fact it was bl**dy cold. Still there were vouchers to distribute so that the brave members who had turned up, 23 of them in fact, could take advantage of the bacon cobs and coffee. Have I said it was cold? 10:00 the first shots go flying down the range and the countryside vibrates to the cacophony of igniting nitro and hammered steel. The coffee, tea and bacon cobs were being consumed at a considerable rate and everyone was enjoying the camaraderie. By 15:30 all but the hardiest had returned home for Sunday lunch. Those who remained burned off the last of their ammo and the shoot finished at 16:00. Many thanks to Rob and his team and helpers from the club and of course the Proprietors of Garland Shooting Ground. Staffs Phoenix Joint and Inter Club Indoor Shoot Saturday February 18th 2017. In complete contrast to last week’s outdoor, freezing, damp, miserable February weather shoot, in spite of which 23 turned out, today’s shoot was indoors again in our frequently used comfortable venue in conjunction with other clubs. Hot drinks, pies, buns and biscuits in abundance set the scene and good to see lady members of the clubs in attendance. A variety of calibres were employed from .22 upwards with discussions amongst members what would be most suitable to finish off the many details. Eventually Mr 45 was chosen and with no buffalo present as targets as in the old west, the standard targets were appropriately accurately punched. Perhaps the severity of the .45 was a bit on the heavy side for the ladies but none the less they persevered and performed the detail admirably. Once again thanks to members for the distances travelled to attend including particularly those from Yorkshire. Many thanks to all who attended and as usual their help and assistance. Kingsbury Morning Shoot, Saturday March 4th 2017 on A range. Very heavy non-stop rain all day and through the night Friday 3rd did not bode well for today’s shoot, in addition to which some of our essential officers were suffering typical winter bug health issues so couldn’t attend. Well, once again, no need to worry on either of these problems. Mother Nature was very benevolent to us again, for which we are most grateful. Whilst perhaps a little on the cool side this was soon rectified by warming sunshine for most of the shoot, very pleasant in fact. Goodwill and spirit of the club cancelled the other problem when officials and RCO’s came in to fill the breach so that the shoot could go ahead with a full complement of three RCO’s, first aiders, training officer and officials, very many thanks to you all. We and another club were on range this morning so arrangements meant a little slower start perhaps but we worked well together at three hundred yards. Sixteen members of our club included two new members who had not shot at such a distance with full bore previously. What a treat it apparently was and thoroughly enjoyed under the direction of our excellent well-travelled training officer. The shoot was completed with a variety of models and calibres and highlighted by the number of “five” scores and “V” bulls. An excellent morning’s shoot was enhanced for the writer as he and his colleague the vice chairman indulged in their passion for marmite sandwiches during the event. What could be better, a fellow consumer of the now famous sandwiches, or is it infamous? Scrumptious! Chairman Dave , Staffordshire Phoenix Rifle and Pistol Club. What a difference in the weather. Last month was cold, in fact I think I mentioned that is was cold. Today it was quite pleasant, overcast to start but clearing enough to let the sun warm most things through. Anyway, the usual crowd of church service dodgers turned up and with several new members attending for the first time the numbers there from our club soon rose to 35. Additional metal plate targets had been placed down range and soon the air was full of discordant sound emanating from 20 or so different gun barrels. The burger van was busy dishing up bacon and sausage cobs; or baps, barm cakes, muffins, buns or any one of the other 13 names used to describe the same bit of bread depending on where you were brought up (Leicester is correct of course in calling it a cob :)). The day progressed with more and more lead being sent through the sound barrier and a great time was had by all. WHITTINGTON 25 METRE SHOOT SATURDAY March 18th 2017. Mother nature is being very kind to us, with again, a lovely mild day for our 25-metre shoot at Whittington No4 range, morning session. A full compliment turned out including our black powder enthusiasts, some new to this discipline. Probationaries were soon applying the training course and schedules, there being much to learn, the officials were kept very busy with small to large calibres and black powder the order of the day. Safety issues were predominant and with the black powder, no one seemed to mind the usual somewhat dirty, greasy, smokey residues, so familiar to our black powder regulars. All part of the fun some say. Keep the hand cleaners at the ready? A full and varied course of disciplines was completed with some fascination for the black powder for those who had never seen it previously. The usual help for us old guys was again appreciated so thanks to all for a pleasant mornings shoot. WHITTINGTON 25 METRE SHOOT N0 3 RANGE SUNDAY APRIL 2nd 2017. A little overcast on the way to Whittington no 3 range this morning. However it soon cleared to become a nice pleasant sunny morning. After an excellent thorough briefing by one of our new RCOs the mornings details began in good order with the event turning out to be a particularly pleasant sunny social event in addition to the shooting. We even received a call from one of our holidaying officials in foreign parts who was so concerned he was missing the usual ambience and his recoil therapy. Quite a tribute to our comradeship. Many thanks to all who attended and our wealth of fully qualified range conducting officers, officials and helpers. You really are an exceptional lot. Staffordshire Phoenix Kingsbury 25 metres Morning Shoot Saturday May 6th 2017. Am writing this on a sunny Sunday morning in complete contrast to yesterday’s Kingsbury 25 meter shoot. The shoot morning was introduced by shivery bitter cold winds accompanied by drizzle and was one of the least inviting circumstances to turn out for any shoot. Fortunately by the time of the morning’s range brief by another of our new RCO’s, the drizzle had ceased and just left us with the blustery cold winds. Numbers perhaps down a little due to the weather, non-the less a reasonable turn out enjoyed a very pleasant mornings shoot. Our training officer was kept very busy assisting zeroing new equipment whilst the new RCO carried out his duties impeccably. Many calibres were employed from .22 upwards with vermin controllers checking very precise zeroing and target shooters achieving high standards. Many thanks to all you hardy men and girls for attending and all you officers and administrators for the regular shoot support. Some of you travel long distances to get to shoots and this is very much appreciated by all. Garlands 14th of May 2017. A beautiful morning after a night of rain, greeted those who got out of bed to enjoy another day of bangs and banter on the range. 27 members turned out and some brought guests to enjoy the day, everyone was welcomed to the range by the organiser in the briefing and the day started promptly at 10.00. The chuck wagon was kept busy all day and provided all the usual baps buns and drinks throughout. There were new toys to play with and the accuracy was not affected at all whilst getting used to them. Several potential new members turned up to meet and greet the club members and to see what was going on, they were not disappointed and enjoyed their short introduction to target shooting. A good day was had by all and the usual support from members in mentoring and advice was well received and appreciated. After a very busy day we concluded at 16:30 to wend our weary way home and to contemplate cleaning all the gear and restocking for the next shoot. Staffordshire Phoenix Kingsbury 25 m Morning Shoot Saturday June 3rd 2017. What a pleasant morning this morning was after all the recent heavy rain. The sun was soon warming things up but that naughty wind was being very mischievous. It got quite warm so I took my shooting coat off to then find a big cloud came over followed by a chill wind, so I put my coat on again. We went on like this until mid morning when Mother Nature couldn’t laugh any more and the sun was given the OK to stay, making a lovely June day. Sixteen members, ladies and gentlemen, attended the briefing then the range got going in fine style with such a variety of calibres. Some new “bang sticks” were evident confirming the high spec equipment that is available these days. Bit too pricey for me! The quality of shooting once everyone got zeroed was excellent and made one think about competition which would really test everyone’s skill nerve and pinpoint accuracy. Competition with other clubs has always been most enjoyable. The range was managed so that our black powder enthusiast could have three good sessions and whilst a little rusty to start with – no, his shooting, not his gun – he soon settled down having an excellent group on his final card. A thoroughly good morning for all and the usual thanks must be offered for all the help to support our officials and range-conducting officers. Very much appreciated. Garlands Shoot, 11th June 2017.
involved with sorting out the paper. turned up to support the day. the time I left in the late afternoon. Well, what a lovely period of warm sunny weather we are enjoying with Mother Nature providing more of the same for today’s shoot. A little cloud prevented getting scorched in the sun so just about perfect. As usual, more new members started the training and probationary course with officials appropriately updating their paper work on completion of each section. Some of our friends and officials have collections of rare and unusual firearms which is always a pleasure and entertainment to see them in use and in perfect collectable condition. Garlands provided the usual all day facilities and catering, meaning everyone was well fortified all day with hot or cold drinks, butties of bacon, sausage, bacon and egg or whatever and free by means of the club vouchers always so well received. As usual many thanks to all who attended and helped out and also the friends we meet at Garlands and the very interesting discussions. Although not officially billed as a club shoot, yesterday’s guest day at another indoor venue turned out to be a gathering of club members. Some of our club’s RCO’s, Officials, and Coaches had agreed to help another club with a guest day. Unfortunately many of the guests failed to show up so we were left with two guests and five club members so after the usual coffee, sausage rolls, biscuits and banter we all headed into the range where the fans were on and cool air was circulating around the firing points. Various types and calibres of firearms were used and the guests were left well satisfied, with more refreshments then comfortingly required. After a short period of refuelling and resting the hardy shooters returned to the range to try some of the more unusual firearms owned by our Training Officer. Luckily the range owners had been busy preparing the specialist ammunition needed & great fascination and pleasure was enjoyed by all. Another really good joint event. Saturday 15th was a busy day. At 13:00 we held the first “Introduction Meeting” for new members. The idea of the meeting was to impart information in both directions as to what is expected from new members and what they can expect from their club. After the introductions a brief history of the club was given emphasising the ideals of the founders in that the club should be friendly, innovative, and welcoming of change. Health & Safety, the role of the RCO, and range safety and etiquette were amongst the other subjects covered. Questions and answers followed. After the organised talking was done the members were able to handle a selection of deactivated firearms that had been brought along to help them to get to understand the actions and get a feel of the weight of a full bore centre fire rifle. Removal of bolts, magazines, and sight adjustments were just some of the activities that new members were able to try. The meeting finished at 16:15 leaving those who wanted to, plenty of time to get to Kingsbury range to join other members for an evening shoot. Many thanks to the club officials and full members who gave up their chance to see Venus Williams lose at Wimbledon and instead be prepared to be peppered with questions from some very keen beginners to the target shooting sports. *Note. The above post has, uncharacteristically, been edited by the webmaster to spare the blushes and embarrassment that might might otherwise ensue to the article’s author as a result of one or two rather unfortunate (and presumably unintended) errors in its content. Following the induction event eloquently described above, most of those attending then transported themselves to Kingsbury Range, joining more arrivals until a shooting party of sixteen were signed in. Arrangements were soon in place and a full briefing completed to implement 300 and then 600 yard details for everyone. At the start of the shoot the wind was blowing straight down the range so no windage problems, but more about that later. I have to describe my old Parker Hale target rifle with no mod cons whatsoever. Sling and iron sights with the front target sight replaced with a post sight for the occasional deer stalking session when settling down and waiting took preference to moving over distances. As usual the rifle was well zeroed at three hundred so now time to let two of the new chaps experience proper target shooting? Took a while for them to get used to fixing the sling to take all the weight but soon doing well. Just an occasional reminder that it wasn’t a shotgun so don’t pull the trigger, Hold the rifle firmly and squeeze off gently. Excellent the results were some pretty accurate shooting for relative newcomers to the sport. The move to 600 went smoothly and after the necessary adjustments my old Parker Hale was performing again. I am pleased to say compliments from other officials upon my v bulls was much appreciated. Time again to let the new chaps have a session with good shooting and v bulls again evident. The swap over went well but by this time Mr wind was playing his tricks. As RCO I got the full overall picture with the flag at the stop butts moving over to the right and not long after over to the left. Mr wind was sure causing some turbulence for the second evening detail. None the less I was impressed to see all along the line high scores and plenty v bulls. Hmm, perhaps we should consider some more competitions. An excellent evening shoot finishing 9-00 PM and very many thanks again to all for attending and helping out. Sunday morning with a threat of the wet stuff, 0800 arrived on the range with the sun glinting and the birds coughing, cars every where as there were three or four clubs booked in. Once the admin was sorted there were eventually 20 in our contingent, the morning went fairly well apart from some kit failure which is now being rectified by purchasing new kit. Change over at lunch saw some leave for domestic bliss, the more resolute hung in there for the 600 mtr all on our own, again there were kit issues that are being addressed at the moment. Quite a pleasant day until mother nature took a hand and sent a couple of hurricanes, accompanied by stair rods, to see who would give in first. It was not us! We called it a day at 1600 and went home to dry out and contemplate doing it just for the morning on Saturday the 5th. From the committee, we have decided that the older rifles are no longer robust enough to carry on and I have been asked to price and purchase a Howa 1500 in 308 and another in 6.5×55. possibly a Tikka T3 but that is yet to be ratified. To this end I have put in for a variation on the club FAC to get this under way, it may take a few weeks as the Firearms Office are very busy! The firing and butts parties changed over at half time, as did the weather. Thick black loud came scurrying in direct from the Test Match and the shooting group began to look questioningly at the RCO when the first drops of rain begin to beat down. The RCO was unimpressed. If he’d had to get out of bed at dark o’clock and travel 90 miles to stand there, then they were jolly well going to lie there on the wet grass and enjoy themselves ! Clear ? Good, crack on ! Anyway, looking on the bright side, no-one was complaining about the midges anymore. Well, in complete contrast to recent torrential rainstorms, this morning woke up to blue skies and sunshine. Perhaps this is why 25 members turned out to enjoy the day with a great variety of distances and targetry at Garland’s rifle day. As usual free food vouchers were issued to fortify everyone for the day ahead with succulent sausage or bacon rolls and coffee with the safety briefing given in good time for shooting to start at 10-00 AM. The club had acquired a brand new rifle which was carefully checked and zeroed by our officials and on the day our booking officer/RCO, so thanks go to all involved for the work which resulted in vaporised suspended potatoes at some distance, quite a sight to witness. A little overcast cloud didn’t last long and the sun was soon back in full evidence with little wind to worry about. Officials took the opportunity to meet committee wise so a very full day was completed with shooting right up to finishing time. Responding to some good natured ribbing from one of our more animalistic members, our Training Officer, who hadn’t forgotten to attach the barrel to his DTA rifle, replied by hitting 5 ex 5 of the 12 inch steel gongs at 250 mards firing from the sitting unsupported position and then went on to join the Secretary in mashing a few swinging spuds for good measure. Bipods? Pah ! Who needs them ? Very many thanks to all for a great day and to Garland’s for the hospitality and excellent catering facilities. Here’s to the next time! A goodly number of club members turned out and many of them fielded historic firearms rather than modern tack drivers: K98 Mausers, Lee Enfields, P14s, K31s and even a Swedish Karl Gustav were in evidence. The club Training Officer amused (and bemused) many with a suppressed P14 that appeared not to have fired, only for the ‘Dink’ of a strike on a steel plate some 400 yards away eventually to drift back across the valley and deny the notion of the round being a dud. Excellent burgers, bacon sandwiches and assorted culinary fare once again completed a great day. Much to his confusion, the chairman opened his curtains onto a real pea soup of a fog, surely no shooting at all possible this morning, even at 25m. Starting the journey in hope meant more confusion crawling along the roads trying to find his way (he’s only been doing the trip for the last 30 years). Unbelievably, and to his pure delight, within five miles of the range the fog cleared to a nice bright if cool morning. With a chill in the air the firing commenced at 09:00. Lever action, bolt action, lever release, all rattling away with insouciant abandon as the sun started to warm the early morning air. At coffee time, more confusion for the Chairmen, nobody wanted to share his Marmite sandwiches. It did occur to me that the ground tremors detected by the Chinese and the US did not originate in North Korea but were a direct result of the blast from the muzzle break on one of our members’ rifles – I am still wobbling. Another great day on the range, despite being somewhat confusing for the poor old guy with the limp. Garland’s Shoot, Sunday September 10th 2017. The first signs of autumn were evident today with cooler temperatures and blustery winds. Perhaps we were seeing the remnants of the storms and hurricanes suffered by our friends in the USA, but somewhat dampened by the long journey across the Atlantic Ocean. A reasonable turn out today in spite of the above and many other events taking place this weekend. Ladies and gentlemen arrived to sign in and as is the norm on these occasions at Garlands, once the formalities had been completed and free food vouchers distributed, the catering facilities at Garland’s were as busy as ever fortifying everyone with butties, tea or coffees, chocy bars etc in preparation for the day’s activities. 10-00 AM the briefings completed the shooting programme commenced. Friends and officials had the opportunity to meet indoors in comfort and enjoy the usual club business and all encompassing discussions on shooting issues or concerns, always most valuable. Our training officer gave an excellent update on his recent visit to the Czech Tankovy Den and shooting venues, more details from him hopefully and be great to join him next year, for any member? An excellent day’s shooting sports concluded by 4 ish PM and thanks once more to the Garlands team for the excellent catering and shooting facilities and thanks to all who attended, particularly for the help that is always on hand whenever needed. It was a dark and stormy night and the captain said to his Mate, “Mate I want to tell you a story” and the story went “It was a dark and stormy night. Then I woke to sound of my phone and the rain lashing after a dark and stormy night, luckily I had prepared the kit ready for the off the day before, trailer hitched and RASP in hand I headed of to face the elements at Kingsbury with 8 other stout members, not that they were fat, just that they got out of bed to come shooting. Three other clubs were with us and the rain did not discriminate, it picked on us all, by the time of the second session it had cleared to murk and wind which offered a chance to dry off a bit. 9 members on a shoot is just above workable safe level so we had a good day with the Chairman, who is in need of bionic assistance, going and operating a target at his age. Every one mucked in and everyone had a good time but 10% of the club is not a good turn out as 90% are missing the shooting and supporting those who do turn up to shoot, not value for money! “There is no such thing as bad weather only bad clothing” or so they tell me when I am wiping rain drops off my the back of my neck. Lots of shoots booked so hope to see you out and about soon. Sunday October 8th 2017. Garlands Shoot. More remnants of the storms and hurricanes in the USA coming across the Atlantic Ocean were threatening our shoot today. Will it be gales, will it be torrential rain, will it be thunder and lightening ? We’ve had all these on previous occasions! Well, Mother Nature did her work again and presented a very pleasant clear passive day for which we were most grateful. Twenty-four ladies and gentlemen arrived and were rewarded by the day described above. Signing in took place in good order and as is the norm once the formalities had been completed and free food vouchers distributed, the catering facilities at Garlands were as busy as ever fortifying everyone with butties, tea or coffees, choccy bars etc in preparation for the day’s activities. Our training officer was kept busy with new members and assisting technicalities of scope mountings and zeroing etc. Another couple, man and wife came to have a look at us, apparently having heard of our reputation, and following inspections and briefings of our activities, issue of membership application forms was in hand. All our officers assist on these occasions so a great job done by you all, as usual guys. An excellent full days shooting sports concluded right up to finishing time and thanks once more to the Garlands team for the excellent catering and shooting facilities and thanks to all for the help that is always on hand whenever needed. 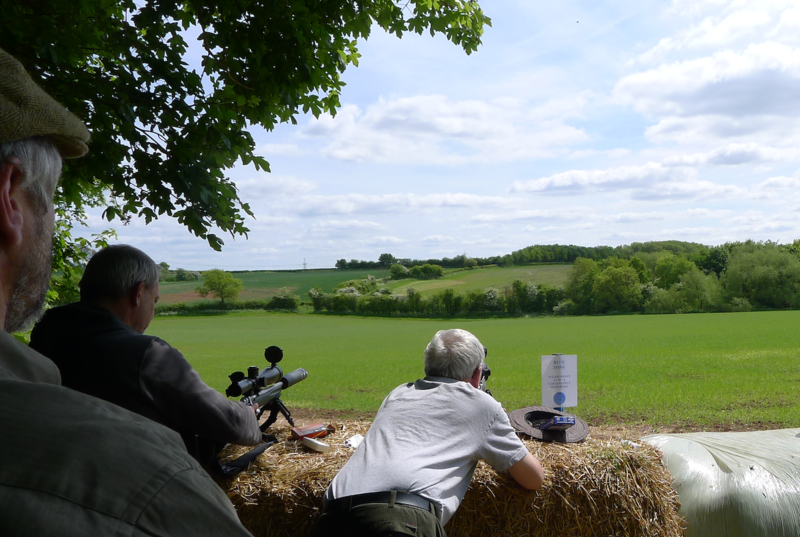 Kingsbury Morning Shoot, Sunday 15th October 2017 on A range. By the time the range brief had been completed the mist had cleared, the rain had turned to a fine drizzle, so we set up at 300m, to commence the first practice. After shooting at Kingsbury Range now for many years, I’ve come to the conclusion that the range has its own micro climate, I blame this on the M42 and the close proximity of Birmingham International Airport and not global warming or the heat from the rifle barrels. The weather did in fact improve for the second practice, who seemed to have the better part of the day. The shoot was completed with a variety of rifles and calibres and highlighted by the number of “five” scored and “V” bulls. The RCO did receive 2, complaints on the second detail, from the markers in the butts, asking if firers on certain lanes/targets could shoot at the small 1 inch black patches placed at the 9 and 3 o’ clock postion, as the “V” bull/centre had been shot out and was now in need of some serious repairs. This does go to show how accurate today’s rifles and ammunition are manufactured to, compared to just a few years ago. Standards have improved across the board. Also, training and instruction at club level has played a major part in this, proving that achieving “V” bulls is not a “Black Art” as some people seem to think. Accuracy does equal consistency. Towards the end the wind started to increase and produced a “fish tail” effect, but scores did remain high with shooters adjusting to the challenging wind conditions. An excellent morning’s shoot finishing at 12:30hrs. and many thanks again to all for attending and helping out to make it a safe and enjoyable time. Designed to be multifunctional, today’s events covered inductionary proceedings, training, full range experience and safety issues along with our vice chairman’s regular excellent firearms cleaning course. The events kept all us officials very busy with little time to indulge in the hot drinks and provisions always available. Competition amongst the different members was high but as always with very good humour and comradeship. 3-00 PM to 9-00 PM was quite exhausting for us older types and those of us with health issues so hopefully now chance to take a bit of a break and some well deserved rest. Well at least that’s my hope! Once again thanks to members for the distances travelled to attend including Yorkshire, Many thanks to all who attended and as usual for the help & assistances. November 11th, Armistice Day. Hoar Cross Game Shoot. Several members of the SPR&PC are also members of the Hoar Cross Game Shoot, a small syndicate that hunts pheasant and waterfowl around Burton on Trent. Today’s shoot coincided with Armistice Day and so was a rather special event. Shooting stopped at 10:30 and a two minute silence was held at 11:00 to remember and salute all those who have made the ultimate sacrifice in the service of their country. A competition was then held amongst the members to win a hand made hunting knife, each competitor donating to a collection to be given to the Royal British Legion poppy appeal. The contest comprised firing a single shot, standing unsupported, from a number of different battle rifles including a Boer War Lee Enfield, a German K98 and a Russian Mosin. After the first round a tie break was necessary as three contenders had all scored an equal number of hits on the target. The tie-break was to be ‘closest to the bull’ with a single shot being fired, standing unsupported, from a .375 H&H hunting rifle. Perhaps fittingly given the average age of soldiers in most conflicts, the prize was won by the youngest competitor – who was also handicapped by being left handed but having to fire 6 right handed rifles ! Well done ! Not only a very enjoyable competition and thought provoking too, but one with a serious purpose and which raised over £300 for the Royal British Legion. A lovely morning to go shooting, cold and crisp to start with bright sunny spells, and despite a slow start, we totalled fifteen cold but determined souls by “kick off” occupying three targets, two per lane, at 300 yards as we were sharing with two other clubs. With all the formalities, out of the way, first shots were going down range at 9 am with some good accuracy being demonstrated by all including the small group of probationers, one of whom had not shot on a military range before. As usual for the Club, there was an eclectic mix of firearm types being deployed covering pretty much the development of centre fire rifles over the last 120 years or so, in fact, some of these old veterans were proving as accurate and consistent as some of the newer types at times…. and that includes the rifles….! It wasn’t long before the centre of the targets were looking to be composed entirely of paste and patches, many shooters scoring highly with a large and consistent number of V-Bulls being witnessed. Thanks to one generous member, we could celebrate the grin factor provided by a MARS rifle as the legislative sun potentially sets on this action type, if the current consultation process goes the way we anticipate it will. A really nice little rifle and a few attempts with the target held, clearly demonstrated that width of grin is intrinsically linked to spread of group size. A nice quick change around at half time and similar performances provided by the second detail led to some significant exertion by the butts party as targets were flying up and down as the shots were made. Well done to all. We were blessed with very little wind throughout and some really nice spells of sunshine with just enough of a breeze to provide an excuse, sorry I mean reason, for the odd shot that didn’t end up in the middle of the target. A great final gallery range shoot for the year with what was blessed by a complete and total absence of marmite! Brrrr, a dull, cold, clammy, slightly drizzly morning rather dampening to the Christmas spirit was soon transformed into a spirit lifting Christmassy event with marmite sandwiches a plenty, chocolate biscuits, mince pies and hot coffee etc. This was supplemented with such great comradeship, which also warmed the spirits. Admin and briefings completed, shooting details got under way with everyone having a full session and that Mr Nagant barking away in fine style as usual. It was quite flashy shooting, which most will know what I mean. Any variation in accuracy was quickly blamed on the conditions but as there was little wind and not too much drizzle other excuses had to be explored. In all fairness accuracy was good as usual but too cold for friendly competition. 12-30 finish came all too quickly with the assembled team wishing all present and all members of the club a very happy Christmas and New Year period. It is a real privilege to be part of such a great assemblage of ladies and gentlemen. Good cheer to all, Chairman Dave.